After the optimism from recent progress in cold fusion, as demonstrated in Italy, Nature surprised us with a severe cold winter in some parts of the world. However, we should not blame climate change for the human suffering when the solution to the problem is in the hands of our civilization. The expectation that the 21st century will bring improved welfare for humanity seems to be an illusion. We are experiencing global crises in different areas such as economics, politics, ideology, natural resources, and the environment. Is there a fundamental reason for the crises and, if yes, what could be the solution? One serious problem today is the mismanagement of our resources?natural, economic, and scientific. The shortsighted view of policy makers is correlated with stagnation in contemporary science. While the science of today is highly dependent on government funding, irresponsible decision makers have made it a servant of dominant groups with common interests. As a result, not only the media and policy makers but also many honest scientists are misinformed. To be more specific, the blame is on the scientific establishments with their bureaucratic style of management. How has this happened? Advances in the field of cold fusion and the recent success of the nickel and hydrogen exothermal reaction, in which the energy release cannot be explained by a chemical process, need a deeper understanding of the nuclear reactions and, more particularly, the possibility for modification of the Coulomb barrier. The current theoretical understanding based on high temperature fusion does not offer an explanation for the cold fusion or LENR. The treatise "Basic Structures of Matter ? Supergravitation Unified Theory", based on an alternative concept of the physical vacuum, provides an explanation from a new point of view by using derived three-dimensional structures of the atomic nuclei. For explanation of the nuclear energy, a hypothesis of a field micro-curvature around the superdense nucleus is suggested. Analysis of some successful cold fusion experiments resulted in practical considerations for modification of the Coulomb barrier. The analysis also predicts the possibility of another cold fusion reaction based on some similarity between the nuclear structures of Ni and Cr. We describe a simple experiment to validate the principle of light isotropy. The method is based on measurement of the ratio between refractive indices of two different optical media by using a collimated beam. The method exploits the speed-of-light dependence of light propagating at an angle across optical interfaces. The experiment provides a means to test for light anisotropy with respect to a preferred reference frame, for example, determined from measurements of the Cosmic Microwave Background anisotropy. Presently, the operational management of the GPS system applies corrections indicating the existence of a universal clock. Other researchers have identified evidence of altitude dependence for the speed-of-light and other speed variation effects. These phenomena do not fully comply with the definition of the inertial frame according to Special Relativity. Previous tests of the speed of light may be categorized into one-way or two-way dependency tests. Two-way tests, such as Michelson and Morley\'s original experiment average a round trip velocity and, consequently, can only provide limited bounds for some anisotropic effects. One-way tests, such as the experiment described here, measuring the speed of light in a single direction may be designed with significantly increased sensitivity to time-dependent variations in light propagation. They may also be designed to be resilient to clock and wavelength variation errors. Our preliminary results indicate a time-dependent variation of the speed of light that is not correlated with CMB anisotropy but is consistent with anisotropy reported by other investigators. The identification of an absolute or preferred reference frame would provide new experimental evidence that may constrain theories that seek to unify gravity with the other fundamental forces or improve the standard model. The expansion of nuclear power during the past 60 years was dominated by the opinion that there is no alternative to nuclear energy. Presently it provides about 14% of the total energy. The policy makers even envisioned that this would be the energy of the future. The dangerous consequences, however, were not correctly predicted. They include nuclear catastrophes from earthquakes, terrorist attacks, nuclear weapons acquired by rogue regimes, and contamination from radioactive waste. During the last one and a half years, the average rate of the earthquakes increased 3 times, and this trend continues. The main reason for the adopted energy strategy was the lack of fundamental research on alternatives to nuclear energy. For our expectations of an environment-safe planet, the outcome from the UN nuclear safety meeting in Vienna, 2011, is not a satisfactory solution. The proponents of nuclear power guarantee a safe future, but safety has been guaranteed also in the past. Furthermore, one main issue is avoided: the danger from the growing radioactive waste. The Fukushima disaster is the radioactive contamination that came from such waste. There is no recipe for cure for this man-made radioactivity, other than time spanning hundreds to thousands of years. The radioactive waste grows by 12,000 metric tons per year?a volume equivalent to 100 double-decker buses or a two-story building with a footprint the size of a basketball court. By year 2015, it will have reached about 250,000 tons. Plutonium?one of the most hazardous nuclear waste products?is a difficult-to-detect alpha emitter in the contaminated environment. A micrograms dose of Plutonium leads to illness and a life expectancy of less than ten years. The Basic Structures of Matter - Supergravitation Unified Theory (BSM-SG) is based on an alternative space concept. The developed models provide a vision for the possible material structure of the elementary particles and the underline superfine structure of the physical vacuum called a Cosmic Lattice (CL). The properties of the CL elementary node and its interaction with the elementary particles gives a clue for the relation between the gravity and inertia from one side and the electric and magnetic fields from the other. The mass appears to be not equivalent to matter but its measurable parameter, so it could be changed by proper modulation of the parameters of the physical vacuum. BSM-SG predicts an unique gravito-inertial effect which was verified by some experiments and was called Stimulated Anomalous Reaction of Gravity (SARG). It is activated by a Heterodyne Resonance Method invoking Quantum Mechanical interactions between oscillating ion-electron pairs and the space-time continuum. The SARG effect occurs in properly activated neutral plasma from selected gas substance. It could be used for development of a new technology for space drive method called Field Propulsion that could be used for interplanetary travels. particles in pure empty space. embedded in the properties and interactions between the CL structure and the structure of the elementary particles. A self-organized process of structural formations from FPs govern by SG law leads deterministically to cre?ation of space with quantum properties (a physical vacuum) and a Galaxy as observable mat?ter. All known laws of Physics are embedded in the underlying structure of the physical vacuum and the structure of the elementary particles. The fundamental SG law is behind the gravitational, electric and magnetic fields and governs all kinds of interactions between the elementary particles in the space of physical vacuum. The new approach leads to understanding the underlying material structure of the physical vacuum, called a Cosmic Lattice (CL) and the material structure of the elementary particles. The analysis of the CL node dynamics, the light propagation and the oscillation properties of the electron permits derivation of the basic CL space parameters and understanding the physical relation between the gravitational, electrical and magnetic fields. This put a light on the quantum and space-time properties of the physical vacuum and permits envisioning of unknown so far physical mechanisms. Among the major predictions of BSM-SG theory are: existence of hidden space energy of non-EM type and a possibility to change the gravitational mass of material object based on a particular physical mechanism. A major result from the BSM-SG unified theory is the unveiled material structure of the elementary particles and the atomic nuclei. They are graphically presented in the appendix Atlas of Atomic Nuclear Structures covering the elements from Hydrogen to Uranium. The spatial arrangement of the protons and neutrons matches exactly the raw and column properties of the Periodic table of Mendeleev, while exhibiting features defining the chemical valence, Hund's rule and Pauli Exclusion Principle. The unveiled atomic models are verified by the known structures of some organic molecules, biomolecules and crystal images from tunneling microscope. The synthetic atomic models are potentially useful in the fields of nanotechnology, structural chemistry and biomolecules. According to Basic Structures of Matter ? Supergravitation unified theory (BSM-SG), at the fundamental base of the observable Universe are two super dense Fundamental Particles (FP) associated with the Planck's scale and interacting by Supergravitational (SG) forces that are inverse proportional to the cube of distance. The SG forces allow congregations into hierarchical levels of 3D formations with rich vibrational properties. One type of formations builds a superfine structure of the space called a Cosmic Lattice (CL). The distance between individual CL nodes is in order of 1E-20 (m). Other types of formations are imbedded in the material structure of the elementary particles. The CL structure defines the space-time and QM properties of the physical vacuum and it is involved in the propagation of the electrical, magnetic and gravitational fields. The CL structure contains two types of Zero Point Energies (ZPE) ? a Static ZPE and a Dynamic ZPE. The Dynamic ZPE permits the existence of Electric and Magnetic fields, so this energy is predicted by Quantum Mechanics. Its signature according to BSM-SG is the Cosmic Background Temperature of 2.7K. The Static ZPE is defined as a pressure of the CL structure on impenetrable volume of the elementary particles. It is 6.8E22 times greater than the Dynamic ZPE, however, it is not of EM type and cannot be envisioned if considering that the space is void according to the space concept adopted in Contemporary Physics. In atomic nucleus the Static ZPE is in balance with the nuclear binding energy that is behind the strong forces between the protons and neutrons. This is the energy given by the Einstein equation E = mc2, where m is the mass deficiency. The Static ZPE energy is the fundamental source for the nuclear energy and all types of energies in the observable Universe. S. Sarg, New approach for building of unified theory, May 2002 http://lanl.arxiv.org/abs/physics/0205052. S. Sarg, BSM-SG Unified Theory, IX International Scientific Conference, Space, Time, Gravitation, 7-11 Aug 2006, St. Petersburg, Russia. (Conference Proceedings, 2007). Book reviews - Physics in Canada, V62, pp. 206-207 (2006). S. Sarg, BSM ? Supergravitation Unified Theory: A New Approach in Physics, NPA video conference, 29 March 2009. According to BSM-SG concept the physical vacuum contains superfine underlying structure called Cosmic Lattice (CL). The individual nodes of the CL structure are formed by four prism-like sub elementary particles held by SG forces and build in hierarchical orders from the two Fundamental Particles associated with the Planck's scale. The two types of CL nodes are arranged in a diamond-like lattice, following an alternative order with internode distance about 1E-20 (m). The individual CL node has two set of axes: xyz ? orthogonal and abcd ? axes with 109.5 deg between them and aligned with the prisms axes. The SG forces along abcd axes are thousand times stronger than along the xyz axes. EM waves involve oscillations along xyz axes, while the Newtonian gravity is a propagation of the strong SG forces by abcd axes. Small gaps between the CL nodes are kept by the specifics of the SG law while this allows complex oscillations with two identifiable cycles: one with a proper frequency of 1.93E29 Hz and a second one with the Compton's frequency 1.2356E20 Hz. The CL nodes, regarded as Phase Locked Loop oscillators, are synchronized at their proper frequency by phase propagated with a speed of light for the length equal to the Compton wavelength. This feature assures the constancy of light velocity and a normal propagation of the Newtonian gravitation. BSM-SG predicts that if the CL node synchronization around an object is partly disturbed, both the gravitational mass and the propagation of light will be affected. BSM-SG unveiled also the structure of the electron that defines all of its QM properties. This allows to understand the possibility to affect the synchronization of the CL nodes by using the spin flipping of the electron. The theoretical prediction was tested and confirmed in a small-scale lab experiments. The observed effect is called Stimulated Anomalous Reaction to Gravity (SARG). According to BSM-SG this is a gravito-inertial effect that could be used for a propulsion mechanism of new type in which the force field is obtainable as a result of unidirectional change of the mass. Book reviews - Physics in Canada, V62, N4, pp. 206-207 (2006). S. Sarg, Method and apparatus for spacecraft propulsion with a field shield protection, Patent pending, Appl. No. 2,638,66 / 25 Nov 2008, CIPO Canada. 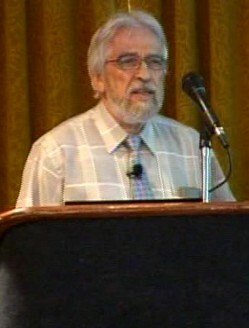 27th Annual Meeting of the Society for Scientific Exploration, June 25-28, 2008, Millenium Harvest House, Boulder, CO. The Basic Structures of Matter - Supergravitation Unified Theory (BSM-SG) is based on an alternative concept of the physical vacuum. At the basic level the theory suggests a physical model of two fundamental particles associated with the Planck's scale parameters (time and length). In pure empty space, as assumed precondition of the physical vacuum, they interact by close range forces according to a law called Supergravitation (SG) and congregate in formations possessing vibration properties with embedded frequency ratio equal to the fine structure constant, ~ 1/137. Such formations are embedded in the superfine structure of the physical vacuum and the elementary particles. In the physical vacuum space, the SG forces are strong at atomic distances. The suggested model works well in different fields of Physics. It provides a relation between the electrical, magnetic and gravitational fields with new understanding of the gravity and inertia. The unveiled oscillating properties of the electron  permit understanding the physical mechanism of quantum mechanical interaction between the electrons in EM activated plasma and the physical vacuum. The new understanding about the physical vacuum allows predicting a possibility of unidirectional change the gravitational force acting on a material object. By proper modulation the parameters of the physical vacuum, the gravito-inertial mass of a specifically designed spacecraft would be reduced, so it could be accelerated with less energy. Technically the new space drive mechanism could be realized by electromagnetically activated neutral plasma surrounding the spacecraft. In such approach secondary effects, such as optical glow, hissing noise, light bending and disturbed propagation of EM waves and Earth magnetic field would take place in the surrounding zone. In atmospheric environment, the spacecraft may exhibit a reduced turbulence since the mass of the air molecule should be also affected. The predicted space drive should work also in a deep space. In this case a gas cloud surrounding the spacecraft is necessary. Initial laboratory experiments confirm some of the predicted effects, such as, weak propulsion, optical glow, hissing noise and reduced turbulence. Extensive research in this new field is still necessary. Society for Scientific Exploration video. A physical model of the electron is suggested according to the basic structures of matter (BSM) hypothesis. BSM is based on an alternative concept about the physical vacuum, assuming that space contains an underlying grid structure of nodes formed of superdense subelementary particles, which are also involved in the structure of the elementary particles. The proposed grid structure is formed of vibrating nodes that possess quantum features and energy well. It is admitted that this hypothetical structure could account for the missing 'dark matter' in the universe. The signature of this dark matter is apparent in the galactic rotational curves and in the relation between masses of the supermassive black hole in the galactic center and the host galaxy. The suggested model of the electron possesses oscillation features with anomalous magnetic moment and embedded signatures of the Compton wavelength and the fine-structure constant. The analysis of the interactions between the oscillating electron and the nodes of the vacuum grid structure allows us to obtain physical meaning for some fundamental constants. The physical models of a successful unified theory about the Universe must operate in different phase of matter evolution and different fields of physics. The attempts to build such wide range theory as a bunch of theories developed for different fields of physics are not quite successful. The accumulated knowledge from experiments and observations leads to a conclusion that some of the adopted postulates in the modern physics are not absolutely fundamental, as considered so far. A new approach for building of unified model of the Universe suggests resurrection of the principles of causality and logical understanding for any kind of physical phenomena. It is successfully applied in a new theory titled Basic Structures of Matter, which provides fundamentals for a unified theory about the Universe. The new approach leads to different physical models for the elementary particles and the atoms and also to a different concept about the Universe. In the same time the suggested models exhibit the same interaction energies as obtained by the Quantum mechanics and experiments. The analysis of the physical phenomena from a new point of view allows deeper understanding of the relations between the basic physical attributes: mass, energy, space, time, gravitation and inertia.